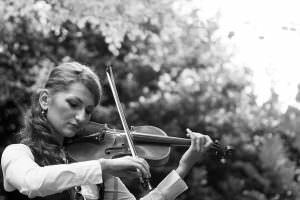 My passion for violin started when I was 5 years old and began my studies at the prestigious Musical Lyceum “Ciprian Porumbescu” in the Republic of Moldova. I subsequently graduated with a distinction for a Licentiate Diploma in Higher Education Music from the Academy of Music, Theatre and Fine Arts, “Gavriil Musicescu” in Chisinau. During my time at the Academy, I participated in many Master classes with famous Violinists such as Charles Sewart (former member of Chilingirian Quartet) and Sandor Devich (former member of Bartok Quartet), violist Jerry Horner (former member of Fine Arts Quartet) and Cellist Laszlo Mezo (member of Bartok Quartet). I also had master classes with Sofia Propiscian (Nijni Novgorod), Emilian Dascal (international soloist), Laura Samuel (former member of Belcea Quartet) and Eduard Grach (Moscow). I was awarded a place in a prestigious project organized by the Romanian Cultural Institute in Bucharest to take part in frequent master classes for professional string quartets with the world renowned “Belcea Quartet“ (London). After graduating, I worked in the National Opera and Ballet Orchestra for three years and joined the National Drama Theatre Chamber Orchestra “Mihai Eminescu” as well as the National Chamber Orchestra “Sala Cu Orga” which helped me gather valuable professional experience. In 2012, I was invited to perform worldwide, including countries such as USA, Holland, Italy, Switzerland, Austria, Romania, Poland and the UK. In May 2012, I was honoured to play at St Paul’s Cathedral in front of Prince Charles amongst other distinguished guests as well as being asked to perform a recital by the well known Funtington Music Group in September 2012. I completed a Masters Degree in Music Advanced Performance with Distinction at the University of Chichester in 2013, having been awarded a full postgraduate scholarship. I now act as the leader of the University of Chichester’s Chamber and Symphony Orchestra as well as having various soloist opportunities. I currently provide private violin tuition and piano lessons to individuals of mixed ages and abilities including: university students, professional and amateur violinists throughout Southampton, Portsmouth, Chichester, Hampshire and West Sussex. I am a Guest Lecturer and Concert Master at the University of Chichester providing private tuition, sectionals and delivering workshops to young talented students and enthusiastic musicians. I am also the Head of Music at Music Maestros, a music school offering students of all levels technically advanced music teachers for violin, piano, viola and other instruments. If you are interested in working with me, then please get in touch.